The school has been operating since 1997 as part of the research efforts of the Institute for the Study of Peak States. 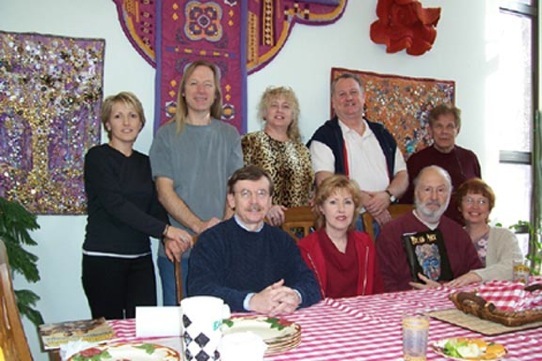 Although the material has greatly evolved since that time, and training has expanded to countries around the world, the camaraderie and enthusiasm of students and faculty has remained the same. Below are some pictures and feedback from courses we've taught over these years. Enjoy! 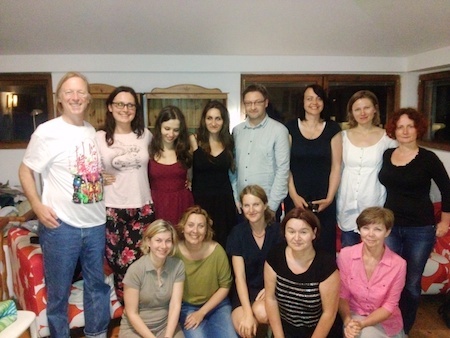 Krakow, Poland 2013 - a month-long therapist training during the summer. "I personally experienced profound changes in the way I act and react in relationship with my partner. Old cords don't even seem to be there any more. Also amazing, is the difference in the good/evil response to trigger situations. The actual fundamental theory of the 'primary cell' and how this can be modified in present time to affect stored responses from past trauma is truly amazing!" "Of the range of contemporary trauma healing techniques, WHH is, in my opinion, the most powerful and conceptually profound process I have found. As a longtime practitioner of EMDR and EFT, there is no doubt that WHH is a large step beyond both in both understanding and healing trauma. 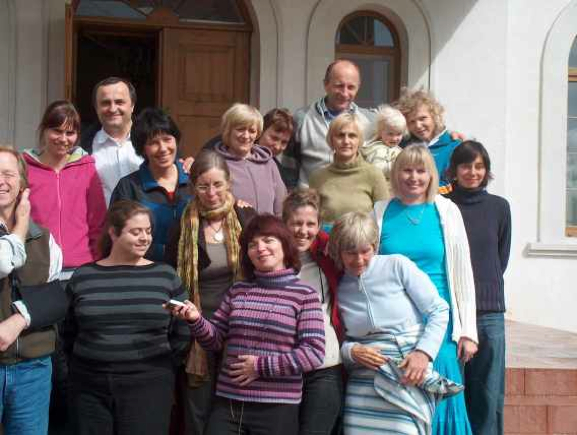 The workshop provides a sound theoretical basis and practical experience. Even more important, the linkage between the natural, inherent ability to experience peak states and their blockage by earlier, often pre-natal trauma is an incredibly important contribution to creating a more complete model of consciousness!" "This is an excellent workshop for anyone doing trauma therapy who has an open mind about consciousness and healing, and not too attached to the laws of physics or religious dogma. As a physicist with a BSc degree - a lot of this is outside the realm of what we know - and - for me, it stands the tests of verifiable experience and results (of healing, change in behavior)." "As a therapist, the workshop was very beneficial in helping me to understand more thoroughly the mechanisms involved as healing is taking place. It has also given me efficient healing techniques to start working firstly with myself and other ISPS students, then on the general population upon being certified! 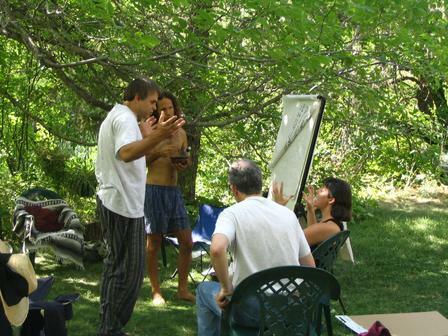 I would recommend those in the healing arts profession take the course." 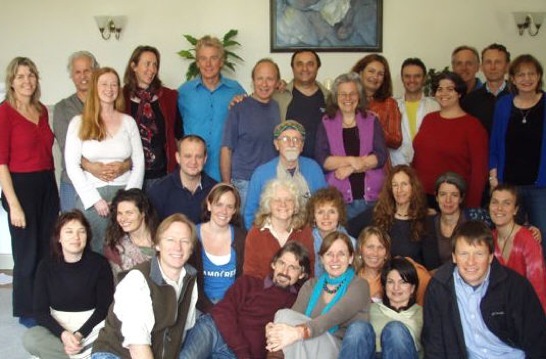 "An amazing journey into the world of 'Peak States', this 10 day workshop was both experiential and theoretical - which I loved blended together. The trainers were very present and totally supportive, the lectures and manual very comprehensive and there was lost of time to practice and compare notes with my fellow students. Thank you everyone!" "This workshop is one hell of a life changer. The reason for coming to this workshop was to "know ones self a little better". In return, this experience and knowledge has given me a blueprint of my past, present and future lives. [It was] a relationship changer on all levels, family, work issues and possibly environmental issues. As an electronics technician, the process of diagnosis is exactly the same. But you just have different tools." "Finally, I got a road map of things that are inside of me. Consciousness is also a structure which you can learn and wander through. If you want to discover more you are on the right website. Use it well. "I could never have expected the result of the Silent Mind Technique. The sudden freedom from noise I was so used to, and the peakce of mind resulting made the course invaluable in itself. And that was just one aspect! I can't tell who should or should not take [the course]." "I recommend this workshop for every professional who works with clients: doctors, psychiatrists, psychologists, etc. You will get better understanding of "what's going on" and collect a lot of beautiful tools for your practice. Also you can gain a few states of consciousness - useful for your life and practice." I found this training "life changing" for me, humanity and this beautiful planet we live on. It can be a pplied at every level of your life and your work (healing practitioners and therapists). Like life, it takes practice, commitment, dedication and patience. However, if I can change my life around in 9 days then I am willinf to take that step. You will too." "I could sum up the enormity of this workshop in a few words. In finding the biological basis for consciousness and ways to radically improve well-being this work makes a breakthrough in human development that is likely to eclipse that of Darwin's theory of evolution and the discovery of antibiotics combined - it is way ahead of its time." "For any therapists who are tired of "nearly" healing people, or who have that feeling of "I'm just missing somthing but I don't know what it is..." - this is it. Practical, fast techniques to finally access those traums and allow them to heal, in a model that completely explainds mechanisms of trauma and healing (and just about every experience on the way). This course will change your life! Prepare to have your paradigm shifted. You'll be a much, much nicer person after basic peak states. There is no excuse for not healing after taking this training." "The Peak States training with Grant McFetridge was a fascinating journey into a world of the formation and beginnings of precellular life. The understanding of life at hose very early stages enables us to heal at profound levels, which opens up huge possibilities for super health in ourselves and the possibility of living everyday in peak sates of consciousness. Wow... imagine living each day feeling magnificent and full of love and having optimal health. I believe it is possible! Imagine a world of health, love and peace and people with incredible abilities. This time is here! This workshop is definitely opening up a whole new way of life. I highly recommend it." Christine Savage 03 95896757 Australia, February 2006. "I am in awe of the power of this work - and of the level of compassion that drives it. I experience this leading-edge approach to healing and growth as the ultimate in 21st Century knowledge and application. I have been experiencing powerful healing and growth methods - and using them with other people - for more than 20 years. This approach goes even further. I feel profoundly healed in the core of my being, and the wonders are ongoing!" Annie O'Gradie, (08)8537 0447, Australia, February 2006. "I was looking for greater precision in my own healing as well as for my clients and I found it at the Peak States workshop. I now have a lot more tools at my disposal and feel very excited about where this work may take me in the future." I am in awe of these materials. This is 21st century healing that works! Regenerative healing is no longer a dream. It's happening through Grant's work. I've healed issues in this training that I've worked on (without success) for years. Therapists need these tools." "Grant's work will be relevant to those people who are keen to push their own boundaries to see how wonderful the quality of their life can be. You must be prepared to trust the process and have courage to face your own issues." "Really valued learning the models and gaining experience in their effective use and application. Very impressed by the obvious benefit experienced by so many in the class. The work has given me a deep interest in and appreciation of the significance and immensity of the entire field of prenatal development. The work is only of value if you put in the hours post-training to refine the skills. Suitable only for professionals who have a real interest in this area and who are ethical and work with a high degree of integrity." 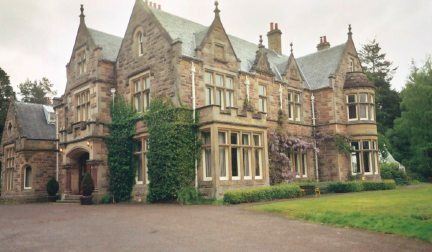 "The work, Whole-Hearted Healing, EFT and other tools taught by Grant and Christine have been wonderful for me to go deeper within. I feel that this work has already changed the 'healing' profession but more importantly can change the world. I look forward to continuing with this work for myself and others in my life. Love you Grant and Christine, looking forward to spending more time with you both in the future." 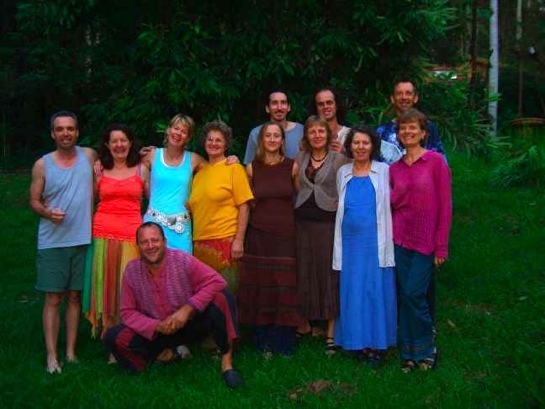 "This is a practitioners workshop for serious practitioners and healers." 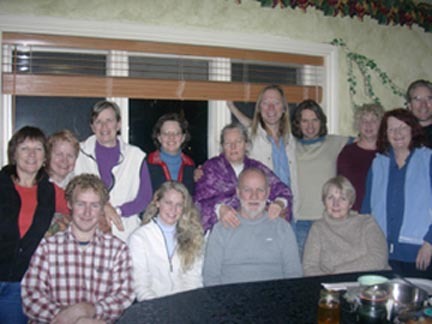 "When I came to this course I was carrying a huge burden of pain that I had not been able to crack, although I had had years of traditional psychiatry and years of breathwork. Through the use of the tools taught in this course and especially through the support of me individually by Grant and Tal (the instructors), I was able to open and receive the healing that I needed to be able to continue on my own (and with support) the rest of the healing that needs to be done for me to enjoy a happy, healthy, and fulfilling life. Pretty good in just two weeks!" "If you are considering this workshop, it is good to have a clear "Yes" and a commitment. The work is challenging. It is important to complete all reading prior to the training as it gives you a head start, especially in those first couple of days when getting used to new concepts. The best training I have ever done!" "Peak states has been a major event in my life. I have healed, grown and literally evolved. not only do I have a much greater understanding of consciousness, but incredibly this awesome toolbox of techniques to keep healing and growing myself and to help heal others and the earth. That was always a dream, now it's a reality as long as I keep doing the work - thank you all so much, I feel deeply blessed." 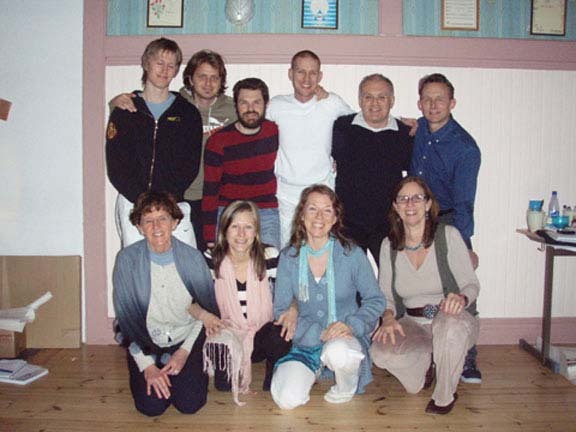 "In nine days I have received a hugely expanded toolbox for my breathwork practice. I have confidence that real healing and real health is not only possible, but very likely using this model. The precision is something I've been working towards for years. I've healed my dominant limiting issue - that thing inside that's stopped me from being who I really am. I have a much bigger sense of what real health is - we have accepted only a tenth of the picture and somehow believe that's all there is. This 10 days will keep me going for a long time - I suspect I'll find the other 9/10's of the picture and then realize THAT is only a tenth! Health is incredibly exciting, creative and joyful." "I came to the Peak States work with both high hopes and some doubts and skepticism. I was unsure from reading background material whether the states and experiences related were subtle internal movies or really profound all encompassing experiences. I was also unsure how real the impact of early developmental events really was. After 10 days of delving into the work - my perspective on absolutely everything has drastically altered. It is by far and away the most powerful, profound, practical and awesomely life-changing work that I have ever encountered, and I have 15 years prior experience of working with all sorts of healing and self-development techniques and tools. This is work for evolutionary change and provides us an opportunity to take a species leap and claim our birthright." 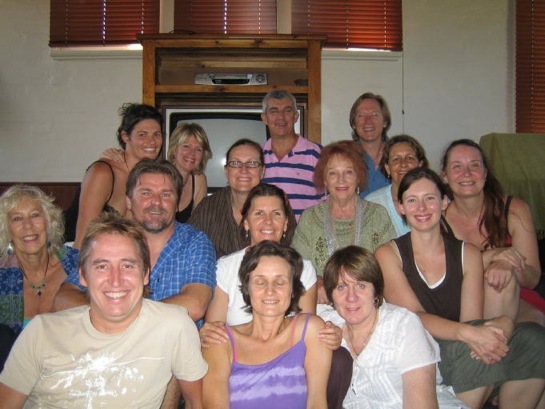 "The peak states training is a must for any therapist working in transformational work. It is the most thorough training that I've encountered so far. It is not for beginners. I recommend it to anyone who has done plenty of personal trauma healing work, whose outer life is in a reasonably stable state, although that might change by doing the work. This cutting edge material requires of the student to be willing to change and evolve with the advancement of the techniques learned. Compassion for people in trauma is required and a lot of patience and the understanding that inner work is ongoing. There is no quick fix for everything. Each new step opens up another. Becoming a therapist or a trainer in the work required a lot of time and dedication for study and practice." "After 6 years of using breathwork mainly to help myself, I have probably resolved more trauma in the workshop than in those 6 years. This work goes to the absolute cause of traumatic events and also to heights of the human experience. I wouldn't recommend this workshop for people not already working on their issues. I would especially recommend this work for therapists and facilitators already helping people, you can gain the most significant tools available to mankind, with no exception!" "It is a great privilege to work with professionals who actually have a larger understanding of the origins of traumas and corresponding elegant tools to heal them. I just opportunity to do my own healing and assist others in their process. Lots of laughs and tears and quiet times." "I wholeheartedly recommend this training to all therapists after reading Grant's books. Grant is a supportive and understanding teacher with a clear vision of the value of his work to humanity. Attending his workshop has reawakened my feelings of gratitude and reconfirmed my sense that there is a way for us all to heal." 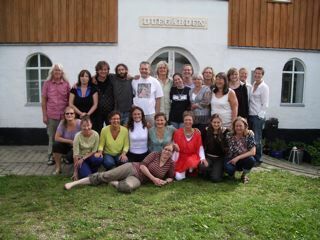 "After 20 years of inner work this workshop was of great value to me. It has given me a new perspective on the evolving human experience. Grant certainly makes out that he knows what he's talking about and maybe he does. His sense of humor and willingness to investigate make for a joyful time. Thank you Tal for your beautiful support." "I have spent 15 years trying to make some sense of my life - clearing birth traumas has helped profoundly to do this, and yet there have been areas where nothing seems to change. The processes in the workshop have supported me to go to these places and get clear and life changing answers. Even simply reading the books and manuals has helped. The work can be quite technical, and will challenge some people's beliefs, and I am convinced that if we want a better world - this is definitely the way to go. Yes, it's still experimental, yet it's cutting edge, yes there may be some errors still, as it is pioneering work, yet I feel there will come a time when this work becomes an integral part of many, many more people's daily life." "A course not for the fainthearted. If you are someone with a vision; of wanting to see humanity healed; of wanting to be a part of healing humanity' then this course would really be of benefit to you, and it needs people like you." "Grant mixes left and right-brain teaching and experience in a delightful and meaningful balance He insightfully coaches and pragmatically cautions to offer a full and life-changing opportunity. I feel more layers peeling from my onion, and even more exciting, I feel a connection to a consistent set of peak states that I never imagined six months ago. Thank you Grant!" "This material is the logical next step for holistic practitioners - especially those practicing meridian techniques. Grant has an impressive body of research and passion for his work that inspires and stimulates your own creativity and re-ignites desires to explore beyond existing paradigms." 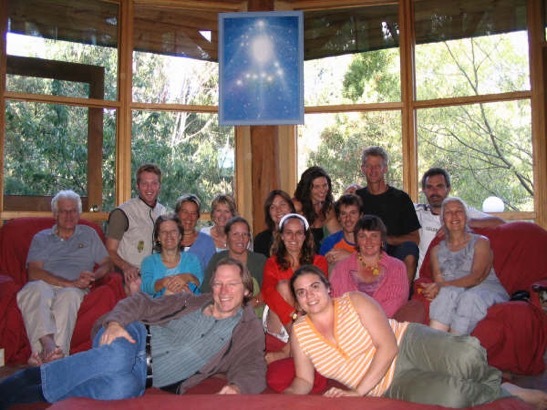 "I would highly recommend this course to anyone who is or would like to be a healer. This workshop teaches techniques that actually work. It gives you a new and better view of life." "I began the workshop with high expectations that I would experience and become the states outlined in the course. I did and then some! I learned about the intricacies of developmental events and starting facts of how these events impacted my life. I feel I have begun to live life as it was originally designed. I am able to replicate what I have learned and did it with another person. Trauma skills were taught and practiced until I felt confident that if I got stuck I had a way through. The states I acquired are Hollowness and Spaciousness. I can see crumples which are the energetic shapes of traumas and I can 'bless and release' them until I see the field of the person or myself is cleared. Somehow I acquired the beginning of the Realm of the Shaman while clearing the 'tribal block'. The feeling of that state so far, inspires me to complete it as it feels the most profoundly comforting. I also acquired two other states called Silent Mind, which blew my mind in a good way since it explained a rash of relationships in my life. Inner Peace gave me room and sense of objectivity on both minor frets and ancient dramas. The pace was relaxed and we accomplished everything we set out to do. Grant, Wes and Nancy are absolutely wonderful as teachers and facilitators. We were a one room schoolhouse exploring the cutting edge of consciousness. All of us transformed, judging by the glow." "I enjoy myself, the people, the teaching, and the teachers too! I love it! I will never forget it. I will use this everyday of my life and with others that want my help. Thank you all, for these learning gifts." "This is one of the best workshops I have attended. Great for anyone who want to work on self improvement and be in a more aware yet peaceful state. I highly recommend it for those wishing to work on obtaining peak consciousness states and to acquire the tools to help others reach peak consciousness states." "I am so much lighter and I know that I am going to be able to remove a lot of my crippling traumas that stopped me from learning to my full potential. Thank you for everything that you have done for. I will never forget you three, especially you Wes for taking that extra time with me. Love, Mercedes." "As we go through life there is a time and place that has a significant feeling. This was one of those. I felt like I had found a part of myself that I knew was there, but had gotten lost in the drama we call ourselves. There is still work to be done but the path is plain. Thanks." "I leave filled with new awareness about the wonders of my life journey; knowing the potential for healing and transformation is real; and the desire to continue researching and exploring the developmental model of peak states. I look forward to fining the many ways I will be able to apply the experiences and learning's in my everyday life." "This workshop was life changing. Before I was uncertain of where my life was going, and I was being pulled in many directions. I was so busy caring for others, I didn't take time for me. I attained a state called Wholeness, and became 'whole'; all of me, was looking at me, and I could see how my busy caring, was interfering with people helping themselves. What a relief to me that was. I feel great! I also reached a state called 'Inner Peace' and my whole inside is bright, the anxiety in the gut is gone. I also attained a state called 'World Inside Body' and I could stretch for miles. I could see a stream and follow it to its source. The sky was me, and I was the sky. That state was hard to get used to. I couldn't find my plate in space, to feed myself. My body adjusted within 1 hour and I could feed myself and function, with a state of awe! This workshop was worth every penny. Some parts brought tears to my eyes and pain to my body. All of this passed with the guidance of these skilled instructors. The price was well worth the results!" "Very good course! Anybody interested in improving their faculties spiritually or not will be delighted." "During the 5 day training you can expect to make changes in yourself which will change the way you experience life." "I didn’t even go to the workshop, but one of the attendees did a specific trauma clearing step with me that she had learned the day before, and I was able to feel myself shed layers of sorrow and darkness very smoothly and quickly, and upon completion my body felt filled with light, illuminated by golden light as if I had just been newly born - all this in just 20 minutes - I feel the potential for healing in this work is immense. I believe that this is wonderful work. Since just dipping my toe into this method, I have found a way to move through and heal traumas that feels almost effortless. All of us deserve to live feeling surrounded by the love and light of our own true essence. Resting in the ground of our being, we can move into and out of traumas with greater ease than I could have ever imagined and this is only just the beginning ... I feel that the potential for healing is limitless." "This workshop reinforced some intuitive knowledge I already possessed; gave me a place to talk about my peak experiences in life; enhanced them and understand them better. All of this combines to now have me experience a much more continuous or stable peak state of being. Thank you Grant, Paula, Nancy, and Steve for sharing yourselves and your knowledge!" "Since the course, when I wake up in the morning my initial feeling of who I am is one of being large, relaxed, pain free and open. Always before, I have been an inventory of various pain and upset. Many other subtle changes are present as well. I notice I have a feeling of compassion and understanding for people who hold opinions contrary to mine"
"Of all the personal growth, healing and self improvement work I have done over the past two plus decades Grant’s information model and ‘technology’ has been the most profound ever! Many other models or schools of thought were known and had a full explanation why it may not be the best for me. I received a full explanation of many of these models all of which made sense for me. I have progressed tremendously by attending a four-day workshop which was equivalent to years of therapy. Thank you, Grant and Mary"
"With peak states work I am blazing into the depths of beingness, elegantly clearing subtle and not-so-subtle events and awakening into new frontiers of light and harmony. In just a week I released major mind chatter. I have come to hear Gaia - a loving universal earth consciousness - dance within and guide and nourish me, and become free of heaviness of many, many prior issues. Even more, I have gained both new methods and abilities to continue opening into new domains of light, beingness, harmony and peak states abilities on my own and to help others. Thank you for this innovative work, teaching and exploration with your awesome commitment!" "Grant takes a unique approach to healing. He does not dismiss healing techniques developed by others, but he simply embraces what actually works. He is refreshingly open minded and approaches his work with the heart of a spiritual healer and the mind of a scientist. I am grateful to have learned from a new pioneer on the cutting edge." "I’ve spent my whole life longing for my own ability to heal and then using that knowledge to heal others. That gift has now landed in my lap. 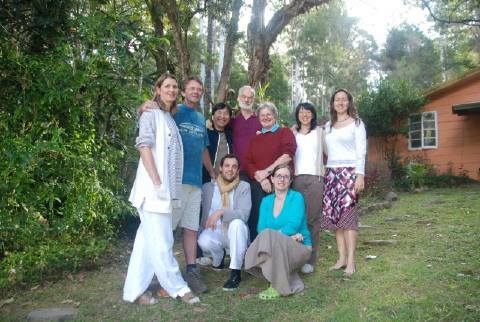 Grant McFetridge’s workshop on peak states was a transforming experience for me, probably the most important in my life. The growth that I experienced in four days was amazing. His techniques for healing traumas really, really worked for me. Elegant in their conciseness, they allowed me to make incredibly rapid strides in my knowledge of my own abilities to heal myself. It’s that certainty of knowledge that I know without a doubt, that feeds my hunger to learn more. Not only have I experienced my own developing abilities with regard to myself, I have personally bee able to use my new found knowledge to help others heal. One person had swelling on her body that had been caused by exposure to poison oak. A particularly painful spot was about the size of a baseball. I worked with her as she healed herself by using a key phrase we learned in the workshop. I was able to give her feedback about what I was seeing in my peak state. I learned that I have subconsciously always had these abilities but now have the strength of conviction to believe in the validity of their presence in me. The result was I saw the swelling go down to about a third its size. Let me say that again ... I actually saw the swelling as it got smaller and smaller. Both of us were awe struck. “This stuff really worked” was one of the phrases we both kept repeating over and over. We then were filled with gratitude regarding the precious gift we had been given. Miracles, you say? Perhaps, but what exactly is a miracle? Do these methods work? I have no doubt that they do. It’s that certainty that drives me forward with excitement to find what I will know next." 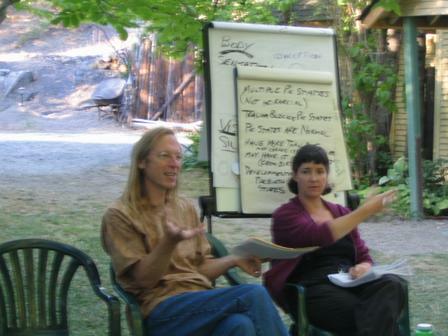 Grant McFetridge and Dr. Mary Pellicer at our first Peak States training class at Trillium Farm, Oregon, July 2004. 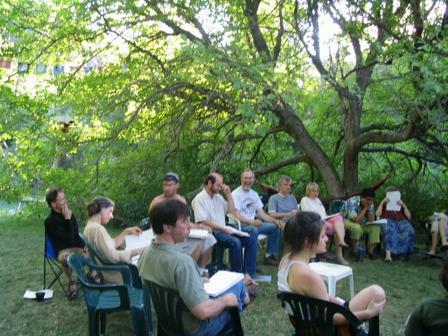 Teaching outside in the summer at Trillium Farm, Oregon. The swimming pond is to the left. Dr. Pellicer answering a student's question. Trillium Farm, Oregon. 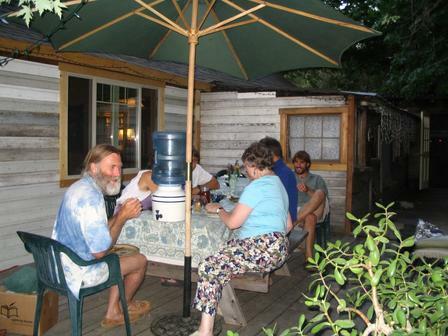 Dining outdoors at our first Peak States 1 training at Trillium, Oregon, July 2004.